This article is about planet difficulty. For character difficulty modes, see Difficulty mode. S.A.I.L. provides a threat assessment for every location in space. Difficulty, or Threat Level, is a rating given by S.A.I.L. to planets, Space Encounters and enemy NPC ships that describes how difficult the encounter will be to survive using "starter" gear. These difficulty levels operate under the larger Tier system shared with Weapons and Armor: as your equipment improves, you become able to cope with an environment for longer until you can last long enough to start exploring the environment in detail without returning to your ship or secure lodgings to recover, but you should not expect to be safe in an environment unless your equipment exceeds that environment's difficulty. In other words, travelling to an environment with gear at the intended level will always be a challenge if you intend to stay for longer than five minutes at a time. If you find an environment easy to navigate, either your equipment outclasses the difficulty of the local hostiles or there are none. Generally, your first successful visit to a new area will be with equipment one Tier below the difficulty of that environment, although doing so will be very challenging and require extra precautions when travelling such as avoiding, rather than engaging, hostiles where possible. 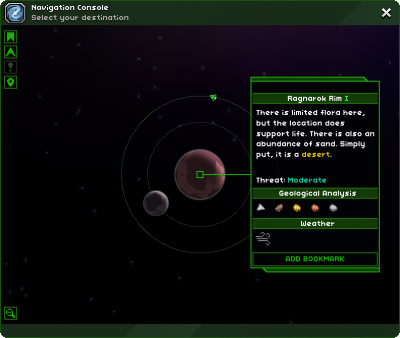 A planet's difficulty is tied directly to its primary Biome, so a Desert planet will be at the "Moderate" threat level whether it is orbiting a "Gentle" Star (Tier 2) or a "Temperate" Star (Tier 3). Space Encounters and enemy NPC Ships have their difficultly level tied to the Star, with Gentle Star encounters at "Low" threat, up to "Extreme" for Fiery Stars. The primary element that these levels directly affect is the strength of monsters and enemy NPCs encountered in the area: the higher the threat, the more hit points they have, the more damage their armor negates, and the more damage they can deal to you. A Bobot fought on a Desert planet ("Moderate") will be considerably weaker than a Bobot fought on a Tundra planet ("Extreme"), despite being the same enemy type. This difficultly is planet-wide, not tied to Biomes: a Tundra planet that has a Garden sub-biome will have Gleaps far more powerful than those found on a Garden planet ("Low"). Treasure generation is also affected by difficulty level, so the contents of storage devices the player finds will likely have more powerful randomly-generated weapons, larger sums of Pixels, and better chances of containing rare items in more difficult areas. These threat assessment descriptors are used for Planets and any other entity that is treated as a Planet by the game engine, such as Moons. The Planet you orbit at the start of the game is always Tier 1. Space Encounters are intended to be visited by more advanced players and so have different threat assessment descriptors to account for the skipped Tiers. Environments that share the same Tier are as difficult as each other and should be attempted with equipment of the same quality. You should avoid attempting any Space Encounters until you can cope with other Tier 3 environments. The "Unknown" threat level is meant to be ambiguous, in that no threat exists whatsoever until you acquire Erchius Fuel or bring some with you. It is actually registered in the game files as Tier 1, the lowest tier. Friendly Space Encounters can have Treasure appropriate to the Tier of the star they are currently orbiting, although in practice you will find prizes like space-exclusive weapons much less often than in hostile encounters; this is due to there being fewer valid spawning locations for rare treasure in friendly location layouts. The None difficulty simply indicates that you will not be attacked at all in that encounter. This page was last modified on 6 August 2017, at 07:56.